Discussion in 'Traditional Folders and Fixed Blades' started by dalee100, Sep 10, 2008. I've had these about a week now. I've never had these patterns, so it's been fun trying them. The fit and finish is a little variable between the three. The green mini-trapper is far and away the best for fit and finish. I'd put it against any production slippie out there. It walks and talks. And I've come to find that I kind of like the pattern. It's as good a working knife for my day to day use as is my stockman or Vickie Soldier. The half-whittler is a real surprise to me. It's not quite as good a fit and finish as the trapper, but still pretty darn good. The blades don't quite have the nice snap on opening or closing. And the dye job was not well matched on the jigged bone scales. But I really like carrying it. It's light and easy in the pocket. Didn't think I'd really care for it. I only got it because SMKW didn't have the mini-sunfish I wanted. The mini-canoe is perhaps the disappointment to me. While I adore the saw cut bone and fluted bolsters. The fit and finish isn't as good as the other two. There is a .004" gap in the back springs on one end. And the a small .0015" between the brass liner and one bolster. (Hey, as a machinist, I measure ). I know it's not going to prevent it from being a good user. It's just I was hoping that it would be as good the trapper. It's a good slicer though. With a .045 thick main spear point blade it sliced through a cardboard box, a foil pouch, and 2" thick styrofoam with ease. I will continue to carry it, though perhaps not as often as others. All in all, I like my new knives. Rough Rider provides me with inexpensive slippies to expand my horizons all the while making a good solid knife. Could you imagine if RR offered plain carbon steel at these prices? Nice buys. 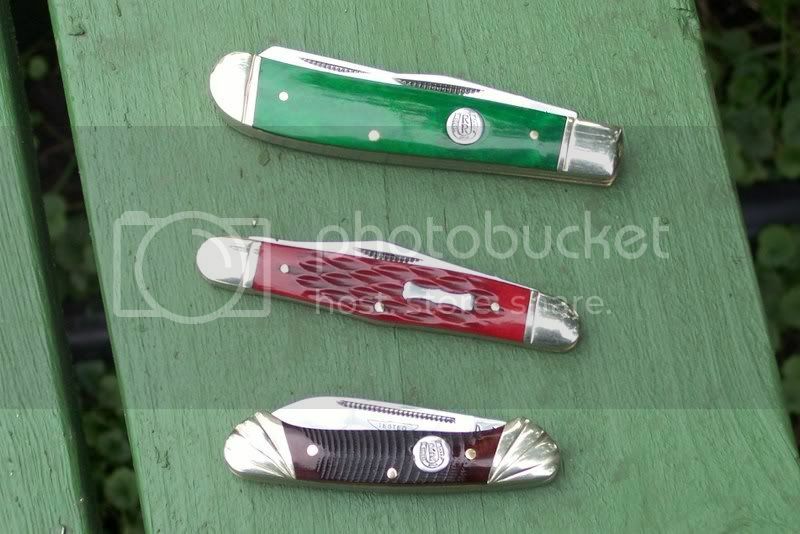 I like the patterns, although i do think the bone colors on the whittler and the trapper are a tad hard on the eyes. I'd like to know how they hold up in the long run. Nice looking knives you have there. 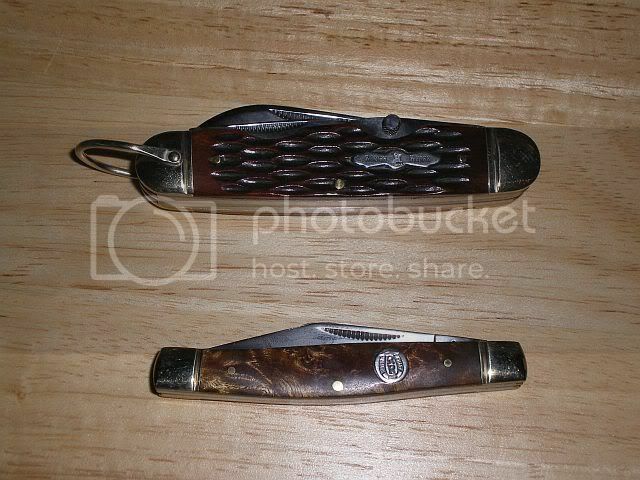 I recently bought a couple of Rough Riders too; A medium stockman and a scout knife. My impression of them is very similar to yours. They are pretty good knives with a few minor issues. I'll definitely be getting some more. I'm finding Rough Riders to be more and more addictive. I think I've bought 16 in the last couple weeks- I have 4 more on the way. I'm lovin' 'em. My favorite so far (I think) is the tuxedo whittler in smooth orange bone. It is NICE. Nicer than most of my Case knives. Rough Rider does a great job with smooth bone. Much of their jigging lacks crispness, IMO- but the gunstock-checkered stuff is excellent. I've been buying them because I've spent WAY too much money on Busse's, and I'm taking a small break from high dollar knives for a while. But I still need pretty regular blade fixes. I'm really enjoying trying out all these different patterns that I would never get to play with if I were only buying Case or Schatt & Morgan or Bulldog. I'm also starting to modify them, to embellish them and make them even nicer. I can develop my skills on these cheapies before I try messing with "fancier" knives. That has been a lot of fun, and I'm learning a lot about what works and what doesn't. Here's my little tuxedo whittler. Not bad for $8.99. I used to collect Hot Wheels- a lot of Hot Wheels. I used to have over 2 thousand of the damned things at one point (I still have close to that now). I'm starting to get into Rough Riders the way I was into Hot Wheels. I liked to organize my Hot Wheels by color, by grade and type, by age, by where I gotten them etc. I'd just put a large number of them out and play with them the way a kid would. You can do the same thing with Rough Riders, they're cheap enough that you can score a ton of them without going broke. Once I get a few more in, I'll post pics. I'm loving slippies right now. Yeah, the colors are pretty bright, but I was going for different. Actually, the trapper is close to a mallard green. And there are few things I like better than the sight of a bright green-headed drake mallard sliding into my decoys on a frosty morning. So I kind of like the color. The red whittler, well red don't need no reason. The only way to know how they will hold up is to get one and use it. My personal opinion is that they will last about as well as any production slippie. Most slip-joints don't get used hard. A few of us use our knives often, but care for them properly. They are pretty well made. And others here can testify to that. Their weak point is the 440A steel. And even that isn't too bad. I tested a stockman my Wife latched on to at 56Rc and a $4.50 liner lock at 57Rc. Perhaps if I remember I'll test that Trapper tomorrow. I like the stockman of yours Joat. And the Scout, while not a pattern I've used, is one like my Father has carried for maybe the last 20-25 years, (he's 75 now). You are so right moonwilson, RR's are addicting and cheap enough to indulge in. You should check out the saw-cut bone scales. The ones on my small canoe are very well done. I think you would like them. You are so right moonwilson, RR's are addicting and cheap enough to indulge in. You should check out the saw-cut bone scales. The ones on my small canoe are very well done. I think you would like them. Yes, you're right about the saw-cut bone scales. I have the razor and large toothpick with those scales, and they are very nice. The bolsters in that series are the nicest Rough Rider makes, I think. Sort of an embossed shell design. I'm stalking the UPS guy right now- he should be bringing me some new scores any minute. All whittlers. I've been reading that the steel used in Rough Riders is actually 440C, rather than 440A. Which would be very good- 440C is nothing to sneeze at. I need to look into it a bit more and confirm. Has any one been buying the RR blue or pink cancer knives from SMKW? I have 4 of them now. Seems to be well made and the profits go to a good cause. My personal opinion is that they will last about as well as any production slippie. Most slip-joints don't get used hard. A few of us use our knives often, but care for them properly. So far, I've had Rough Riders and Steel Warriors for going on two years, and they seem to be holding up fine. Like you said - most slipjoints don't get used hard, so for regular everyday use, I think mine will last a lifetime. For the price, I'll put up with some F&F issues, if the knife is tight and opens/closes properly. They're a really neat way to check out various patterns and see what you like. However: regarding durability, the only complaints I've seen here is that the scales on these brands aren't stabilized - they warp, peel up from the liner, shrink back from the bolster, "bleed" pigment if your hands are sweaty or wet, and the pigment isn't as deeply "imbedded" in the bone. Up to three months ago, I hadn't seen any peeling/shrinking with any of mine, but on looking at my SW Congress yesterday, I noticed that there are gaps between the bone scales and the liners, on both sides. It's been hot & dry here, so maybe with the fall weather coming in the scales on the Congress will straighten out. We'll see. I don't know what the origin of the bone is in RR and SW knives, but I heard that Case uses the upper leg bone of cows for their jigged bone scales, which apparently is very stable. I haven't had any issues with Case like those mentioned above with RR and SW. I've heard that SMKW uses camel bone for some of their knives, but I don't know how it compares to cow bone. I have bought 8 RR in the last two weeks. All of them have had really good fit and finish. Here are two stockmans in orange smooth bone. ...My favorite so far (I think) is the tuxedo whittler in smooth orange bone. It is NICE. Nicer than most of my Case knives. Rough Rider does a great job with smooth bone. Much of their jigging lacks crispness, IMO- but the gunstock-checkered stuff is excellent. That's a strange tapered spacer there in the back of that whittler. Can you post a pic of the 'top views'? Ie, looking down on the blades, both open and closed? I gotta get into Rough Riders, right up my collecting alley...cheap quality. Where's the best place (price + service) to get them? Where do you purchase your rough riders? You can't see the backspacers in the closed pics, so I didn't put them up. The backspacers are nicely tapered. It looks a little funky in the first image I put up- it looks like there is a big gap- but you have to bear in mind that the knife is pretty small- not much bigger than a peanut. Oh, and that little spot you see in the gap is a grain of sand or something. I didn't notice it until I posted the pic. The red one arrived this morning. It's just as nice as the first. Fit&finish very acceptable,some variation in colour of the scales.It's been used a lot in the past 2 days to help me move office..take down stuff and prise things out from corners and walls,the awl is very useful indeed. More than fair knife for low price. I'm now in the market for a nice, cheap toothpick from them, and started a new thread here to get some comments about all the toothpick brands that shows. There are a bunch to choose from. I have been searching for info in the type of steel Rough Rider uses 440a 440b or 440c.. I have not been able to find this info any where on google. Does anyone know which 440 they use? I can't say for sure, but I'm pretty positive it's 440A. The ones I have don't seem to hold an edge as quite as well as 440C. And they resharpen a whole lot easier than 440C. It's generally assumed that if the blade is marked or listed as being 440, then it's 440A. Otherwise the marker would brag about it being better steel. doesnt feel like 440c to me either. 440A, they actually responded to an email I sent asking years ago. I just took possession of their version of a large sodbuster and it is etched 440A.